A Catholic cemetery is a prayerful place and is considered an extension of the parish ministries, providing a final resting place for those baptized into the Catholic faith as well as people of other faith traditions. The Catholic Cemeteries have been providing experienced and caring service to our Catholic community since 1851. The Catholic Cemeteries are responsibly maintained in perpetuity. Monday – Friday: 8:00a.m. – 4:30p.m. The office is closed on New Year’s Day, Independence Day, Labor Day, Thanksgiving Day and Christmas Day. April 1 – September 30: 8:00a.m. – 7:00p.m. October 1 – March 31: 8:00a.m. – 5:00p.m. All archdiocesan cemeteries are open for visitation every day of the year, subject to weather conditions. Monday – Friday: 9:00a.m.- 3:00p.m. No interments are performed on New Year’s Day, Memorial Day, Independence Day, Labor Day, Thanksgiving Day or Christmas Day. A Catholic cemetery is a place that brings together a number of elements of the church’s pastoral mission: the proclamation of the gospel to arouse faith, examination of the reasons for belief, celebration of the Eucharist, integration of the church community and apostolic witness. Catholic cemeteries exist because of our belief in the resurrection of the body, in some new shape or form, at the end of time. If there were no promise of resurrection and eternal life, there would be no need for Catholic cemeteries. The church provides cemeteries to carry out the sacred religious functions of burial and to care for the resting places of the deceased. Just as the human body deserves to be treated with respect and dignity in life, so should it be treated in death. As a place dedicated and/or blessed for the burial of the faithful, it becomes identified with the local church and gives witness to the faith of those who are buried as well as to the faith of their families. As a sacred place, a Catholic cemetery is a place that serves the faithful and witnesses to the entire world the Good News of Jesus Christ and the hope we share in the resurrection. To this end, it is a place where the signs and symbols of our Catholic faith are displayed with pride and reverence. The Catholic cemetery is the appropriate place for gathering in ritual prayer, such as the rites of committal for the dead and the celebration of the Eucharist on the Feast of All Souls. It is also a fitting place for private prayer and meditation. Held during the Fridays of Lent. All Souls’ Day is a Roman Catholic day commemorating the faithful departed or those baptized Christians believed to be in purgatory. It is celebrated on November 2 unless this date falls on a Sunday. When this happens, All Souls’ Day is celebrated on November 3. St. Odilo, abbot of Cluny, established All Souls’ Day in the eleventh century. The day purposely follows All Saints’ Day in order to shift the focus from those in heaven to those in purgatory. The theological basis for the feast is the doctrine that the souls who, on departing the body, are not perfectly cleansed from venial sins or have not fully atoned for past transgressions are debarred from the Beatific Vision, and that the faithful on earth can help them by prayers, alms deeds and especially by the sacrifice of the Mass. The Archbishop of Louisville celebrates the All Souls’ Day Mass at 11:00 a.m. at Calvary Cemetery. For further details on this service please call the Cemeteries office at (502) 451-7710. No matter how long a life lives on this earth, it is still a life that deserves our respect. Infants lost are like some flowers: they bloom for a brief moment, but in that moment they show the glory of God. Each month, the Catholic Cemeteries holds a brief prayer service to remember those infants who were stillborn or who lived any length of time. Families, friends or others who have lost an infant are invited to attend the service and pray with us for their baby and the others on the last Wednesday of each month at 1:30 p.m. The service is held in Calvary Cemetery in the “Holy Innocents Section” (Section 20). The names of all of the infants buried during the month in any of the archdiocesan Catholic cemeteries will be mentioned during the service. Any other name, whether the infant was buried in a prior month, or in another cemetery, can also be mentioned at the request of the families or friends. Holy water is sprinkled on the graves of those babies buried that month in the Holy Innocents Section. For further details on this service please call the Cemeteries office at (502) 451-7710. Severe weather will cancel. 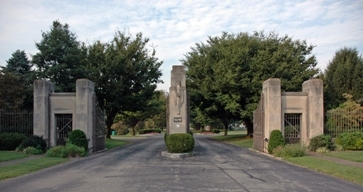 The Catholic Cemeteries of the Archdiocese of Louisville joins thousands of Catholic Cemeteries across the United States in a national celebration to honor men and women who died while serving in the armed forces as well as recognize both active military and military veterans who have served our country. The Catholic Cemeteries of the Archdiocese of Louisville will help you make careful and informed choices regarding your cemetery needs. Our daily ministry and work serves nearly 1,000 individuals and families who are placed in our care annually. The Catholic Cemeteries offer a variety of burial options and services. Our family service counselors will guide you with a full, unhurried, in-depth disclosure of our burial options, services and products so you can make prudent and informed decisions. Our family service counselors are a phone call away after sudden deaths or prior to anticipated losses in our community. Pre-need planning allows for a better informed decision, while relieving loved ones of the emotional and financial burdens at a very difficult time. A pre-planning counselor is available to arrange a convenient time to meet with you and educate you on all your cemetery needs, including cremation. There is no obligation or pressure for you to purchase anything. This is an educational program sponsored by the Catholic Cemeteries of the Archdiocese of Louisville. There are six different grave privileges that can be purchased. Each privilege will determine what type of memorialization will be allowed on the lot. See the details and advantages of purchasing your memorial through Catholic Cemeteries.